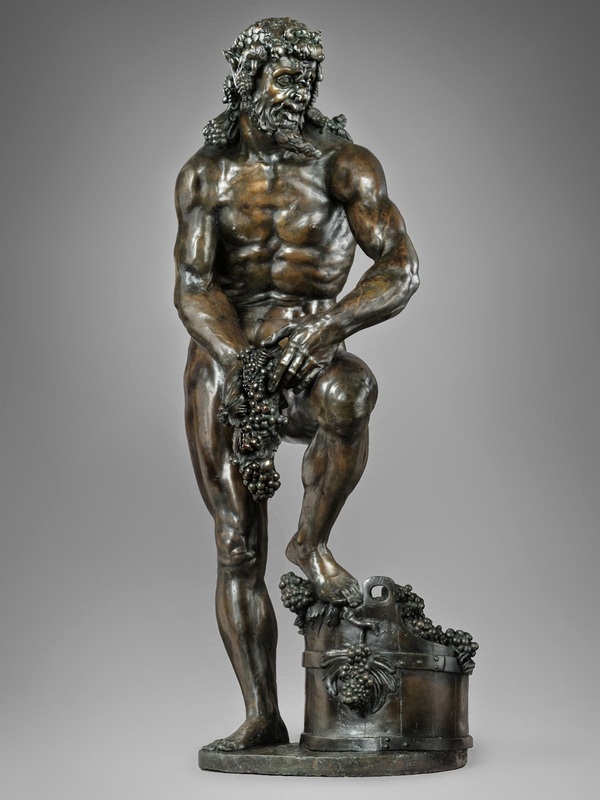 Attributed to Adriaen de Vries, Bacchus/Silenus, c.1579-80, bronze, 89.5 cm, private collection, USA, photograph by Maggie Nimkin. Visited the Frick Collection on Sunday, the last day the museum exhibited bronze statuettes collected by Janine and J. Tomilson Hill. Figures wearing masks intrigue me, and I was struck by the above statuette of Bacchus, the god of wine and mirth, with one foot on a barrel, in his hands a bouquet of grapes, and his face wears a grotesque mask. At first, I didn't realize it was a mask, but the lips are stylized to represent a theatrical mask, the kind actors would wear on a stage. The statuette is small, so perhaps the grotesquery is diminished, but I liked how walking around this figure, I can go from viewing his ferocious face, then seeing his broad back, and the way he commands the space with dominance. The feeling is deception, a feeling masks in general evoke, but it also brings up images associated with playing the part of the god. Is this an actor depicting Bacchus, or is this Bacchus himself donning a mask? Scholars are not sure if the above statuette is of Bacchus or Silenus, his tutor. If it is Bacchus, why is he wearing a mask? If it is Silenus, is he about to enact an instructive performance? It is not uncommon to see Bacchus and his followers wearing, holding, or attending to theater masks. One can see a similar scene painted on a Greek vase, of Bacchus (Dionysus) holding a mask, to represent his patronage of the theater. The theater is a great act of pleasurable deception. Of course, the gods deceive as much as men, according to the stories of mythology, and originally people performed these stories on the stage to honor the god. Now we have Broadway spectacles that do more or less the same. Deception, art, performance, fiction -- it goes round and round. I call it deception not because I am duped, but the pleasure of art is allowing oneself to be duped: for isn't that what we mean by suspension of disbelief? Today, when we go to the theater, actors do not wear masks, but they are "done up" for the stage, and depending on the performance, are always dressed up in costume. Even if the part is of a naked man, the mask is the role, and even if the man does not speak, it is the time on stage, the performance, as it transpires that becomes the mask. Then the show ends, the curtain closes, and both actor and audience let down their guard to go back into the society of others to wear different masks, and to exchange glances, to ready ourselves for other deceptions.